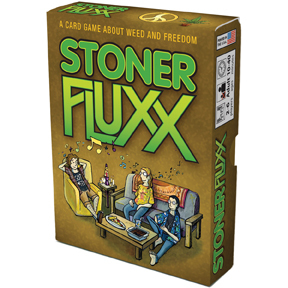 Stoner Fluxx is a marijuana-themed version of the hit card game Fluxx - it's a game about toking with your friends, getting the munchies, and changing the rules. Back by popular demand, this bigger, bolder edition features 16 new cards (including three Creepers!) with new color artwork in a nicer, larger box. The new edition is also being published under a new imprint called Fully Baked Ideas, which Looney Labs will be using to separate their main product line from their adult-oriented games. 5% of proceeds are donated to support the movement to end marijuana prohibition. 100 cards + instructions, in a two-part box (3.75"x5"x1"). Comes in a six pack display (3.8"x7"x8"). If you are uncertain whether to carry this game in your store due to the controversial topic of the game, please ask for a FREE Demo Copy! (Limit one free demo copy per retail store location).